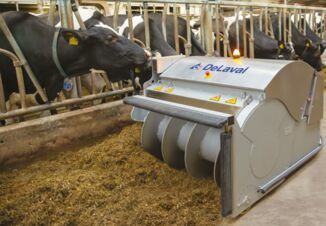 Much of the time spent focusing on nutrition only accounts for the daily feed dairy cows need. Water is often an overlooked component of nutrition and overall health. Cattle get about 13% of their water from a ration in the form of silage and other forages high in moisture. The other 87% comes from a tank or trough. Cows consume about 3 lb. of water for every 1 lb. of milk produced. 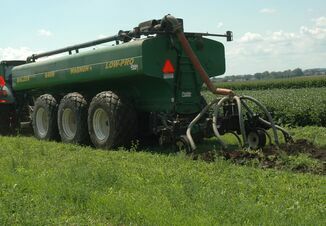 A dairy that produces a semi-trailer load of milk per day will also need to have three semi-trailer loads of water for their cows, says Joe Harner, department head of biological and agricultural engineering at Kansas State University. “The take-home message is the more milk produced, the more water that needs to be consumed, so we have to have adequate drinking space on the dairy,” Harner says. Cows only spend about a minute at the water trough each time they go to take a drink. If adequate water is available, a cow will drink 1.5 to 3 gallons of water per trough visit with a total of six to eight trips per day. “They are pretty efficient at gulping down a lot of water,” Harner says. This begs the question: How do drylot dairies compare on water space per cow? Harner and a group of researchers looked at Google Earth images of 30 dairies in Arizona, Colorado, Kansas, New Mexico and Texas. The average feedline length was 604', roughly 300 cows per pen. The distance from the gate to the first water trough was 150' with 16% of the dairies allowing more than 200' before a cow reached water. Assuming no water was available in the parlor, some cows had to walk about 750' after exiting the parlor to their home pen. The distance from the first and second trough was 175' versus 120' in a freestall. “We’re making cows go a long ways to reach water on drylot dairies,” Harner says. 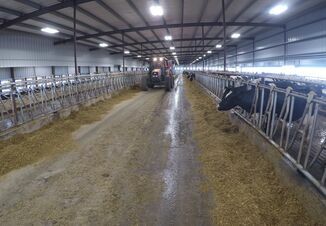 The first trough gets every cow that exits the parlor, but has 37% of the feedbunk space. The second only gets 26% of the feedbunk space, while the third also has 37%. Water space per cow was 2.8" and 67% of the dairies had less than 3". Only 13% had greater than 4" of space per cow. Harner recommends having water accessible upon exiting the parlor. "We want them to be able to drink within 250' of when they step off the platform,” he says. The trough at the parlor exit needs to fill rapidly so it is full when the next group exits. Recharge should be about 1.5 gallons per cow water space. Harner adds that water can be a limiting factor, so troughs should be cleaned regularly.